Our Products Wisconsin Meadows for groceries and restaurants! 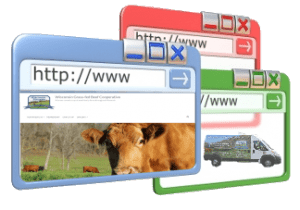 Wisconsin Meadows for groceries, food co-ops and restaurants! 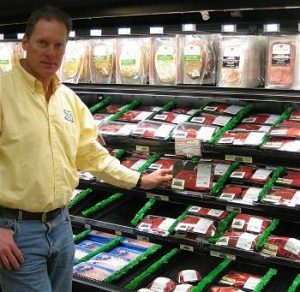 Give your customers the local grass-fed beef they’re asking for! We sell a full range of cuts, from bulk trim and grinds to primals in cryovac, both direct or through distribution channels. 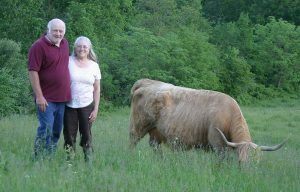 Many local establishments support our farmers by selling Wisconsin Meadows in their stores and restaurants. 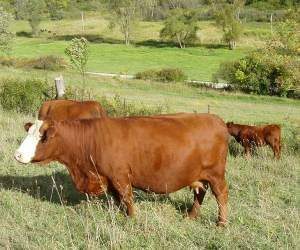 Some stock it on-shelf fresh or frozen, some have our grass-fed beef in their butcher cases. Don’t feel like cooking? 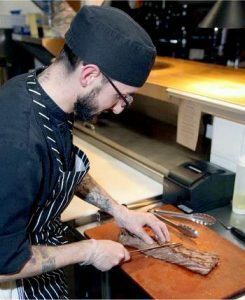 Many fine restaurants around the state serve delicious meals featuring our grass-fed beef. Ask your local store to carry it, tell them you want to support local producers! Click here to see our current list of outlets. If you are a store or restaurant who carries our beef and don’t see your establishment on the list, please e-mail us and we’ll update it! 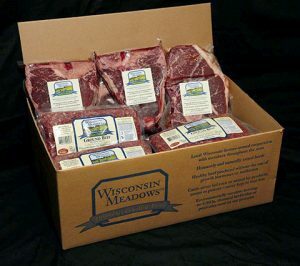 You can try Wisconsin Meadows tm grass-fed beef with our 30 pound Variety Box. approximately 1/8 of a steer). You’ll receive about 20 lbs of hamburger, 5 lbs of roasts and 5 lbs of steak. For maximum sustainability, we endeavor to use all of each animal, therefore your particular cuts of roasts and steak may vary due to availability. Now available as a custom-cut half or whole, fill out our online cutting form to reserve yours and get it cut and wrapped just the way you like it. Our best value, go in with family and friends if you don’t have the freezer space! Pricing for a whole steer is $4.29 per lb hanging weight, yielding an approximate $6/lb finished weight price*. Pricing for a 1/2 steer is $4.49 per lb hanging weight, yielding an approximate $6.50/lb finished weight price*. * The actual finished weight you receive will depend on the cutting instructions you choose. If you have everything de-boned, and decline your soup/dog bones, organs, etc your yield will be closer to 60% of hanging carcass weight. If you take everything you have coming, and include bone in all your cuts, your yield could be as high as 80% of hanging carcass weight. Regardless of cutting instructions, there will also always be a “shrink” or water weight loss, as the carcass hangs and loses moisture. The size of your carcass may vary but the yield percentages will usually remain in the 60-75 % range. Sorry, individual cuts not available direct, please see one of our retail partners. © 2019 Wisconsin Meadows. All Rights Reserved.